This time I was using some great milk, Vital Greens Non-Homogenized 3.5% Milk, so I wanted to make sure I did not waste it. So for this make I decided to use a tried and tested formula, Gianaclis Caldwell‘s version “Milled Curd Stilton-Style Blue Cheese” from Mastering Artisan Cheesemaking. I went with her version than others that I have primarily because it was an eight litre recipe, and I really like her book. It was interesting to see that the cultures were added at a lower temperature than I was used to, and ripening in bundles was interesting, but I will get to that shortly. After reaching 32 degrees Celsius, the CaCl2 was added and then the rennet. 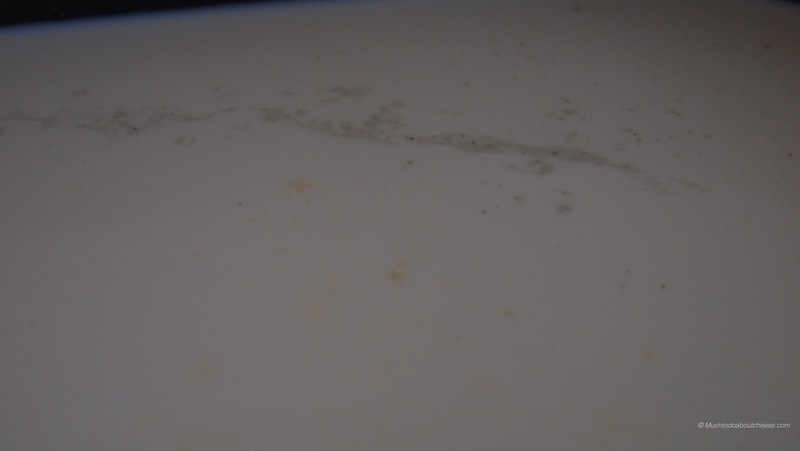 You can see the butterfat on the surface of the milk along with the start of the coagulation. I let the rennet do its thing for 75 min, 15 minutes longer than it should have taken, but I was not happy with the way the curd set when I check for a clean break at 60 minutes. 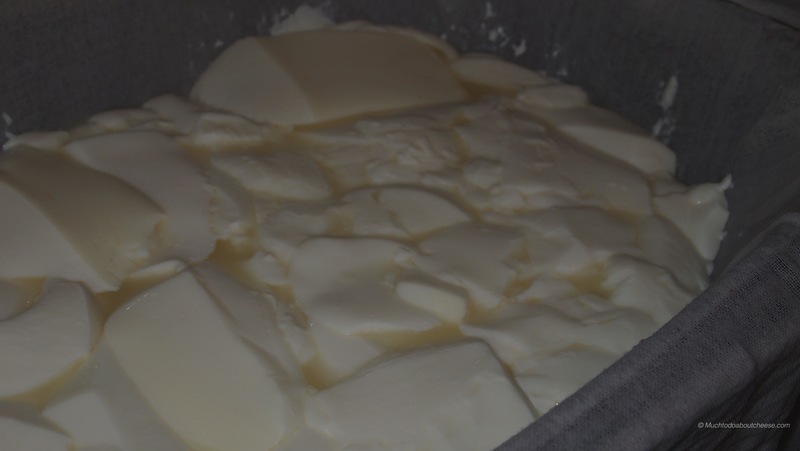 After I was happy with the “Break” I cut the curd and then let it rest for 10 minutes. The next part of the make was ripening in bundles. This was a new concept for me, from what I could gather from my research was that the curd is delicate but still needs the pH to drop (or acidity to increase) and gently firm up at the same time. 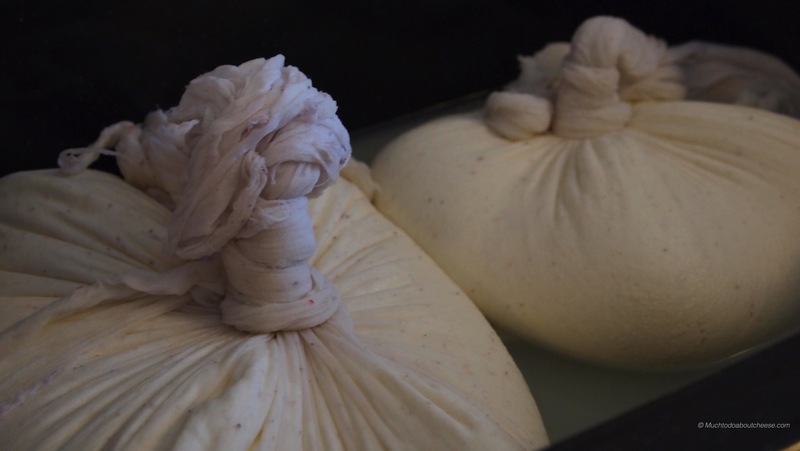 The curd is gently ladled into cheesecloth and then the cheesecloth is tied into bundles using the “Stilton Knot” and then they are placed back into the vat and allowed to ripen further as the whey drains from the bundles. I was surprised at the curd yield. I ended up with two bundles. 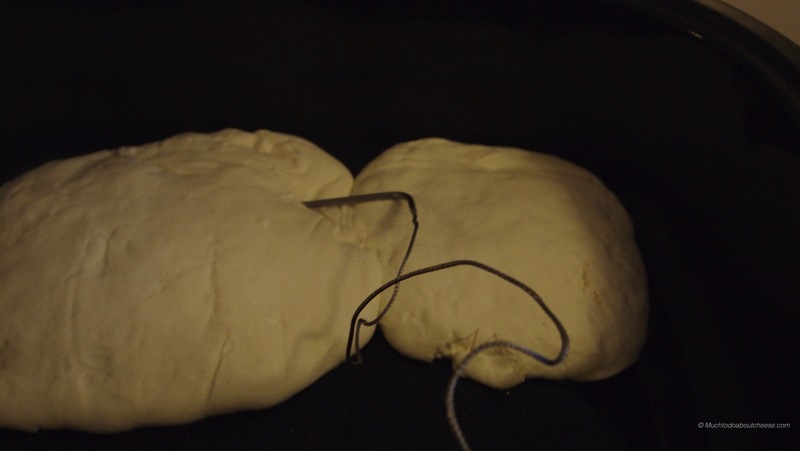 I don’t know if you can tell, but you wrap the knot so that it can be tightened easily. Each wrap goes under the last. The bundles were then put back in the vat and allowed to drain. I kept the temperature of the vat as close to 32 degrees celsius as possible. 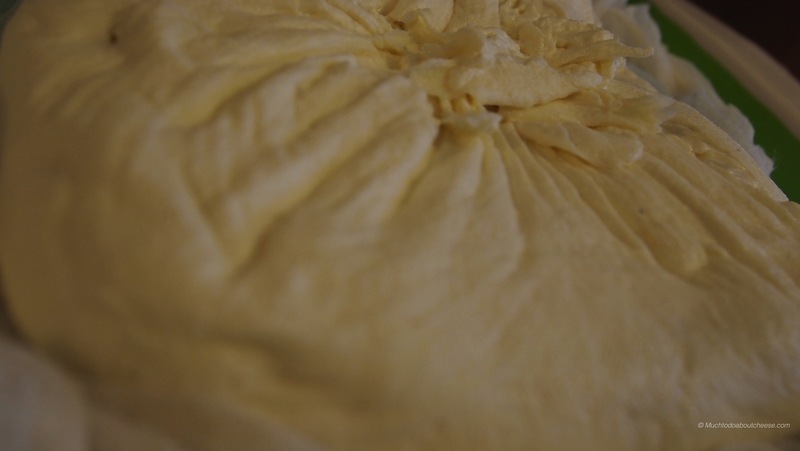 In various versions, the bundles are hung or placed on a board and the whey is allowed to drain away from the curd. 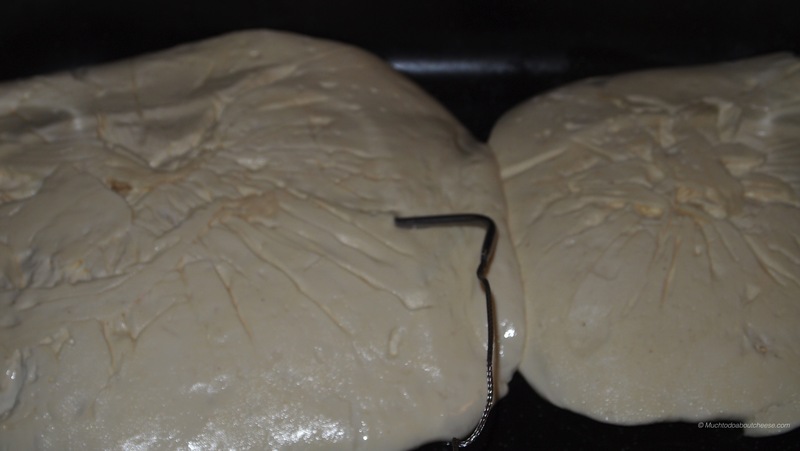 This one said not to drain the whey from the vat, I have to admit I was skeptical about this, but I wanted to follow the recipe as closely as possible. 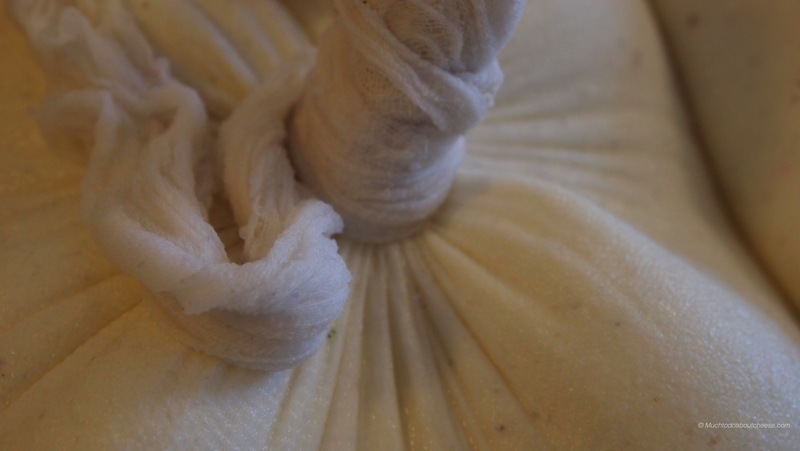 I had to tighten the knots ever so often, this helped to firm up the curd and expel more whey. 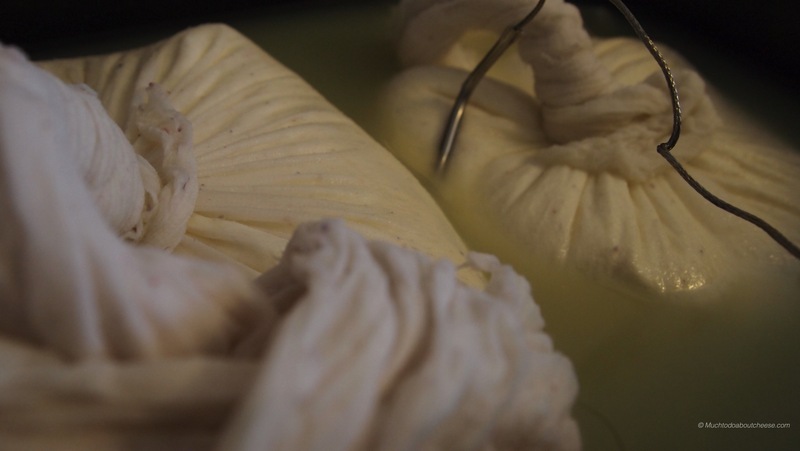 After 2 hours of ripening and draining the curd in the bundles had become quite firm and it was time to take them out and heat the “Slabs” to increase the acidity. The larger bundle was not as firm as the smaller one, but it was just as ready. I inclined the insert in my vat and kept the heat on, the object was to heat the slabs and flip them every hour until they reached a specific pH. Sounds like cheddaring process to me, without the cutting or stacking. 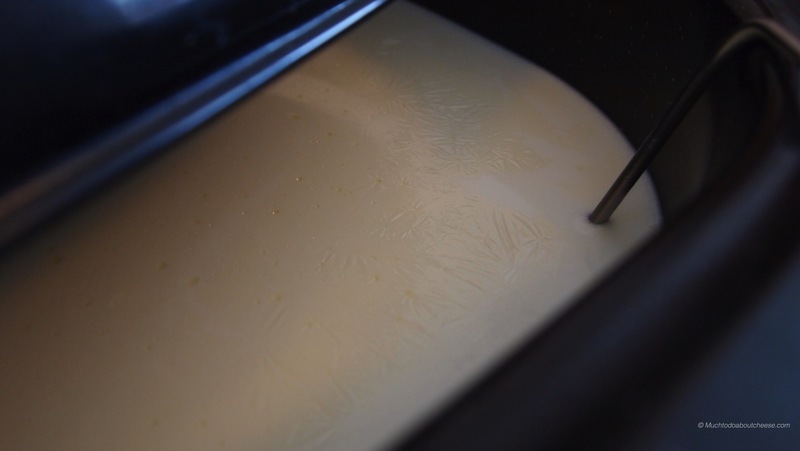 The curd slabs needed to be kept at 32 degrees celsius so I decided to put the probe in the curd. After and hour I flipped the curd and kept on heating. It only took 2 hours to reach the pH I was looking for. I don’t have a pH meter so I have to interpret the pH strips based on the colour variations. It is like guessing but I have had enough practice with Cheddars and Caerphilly to be somewhat accurate. 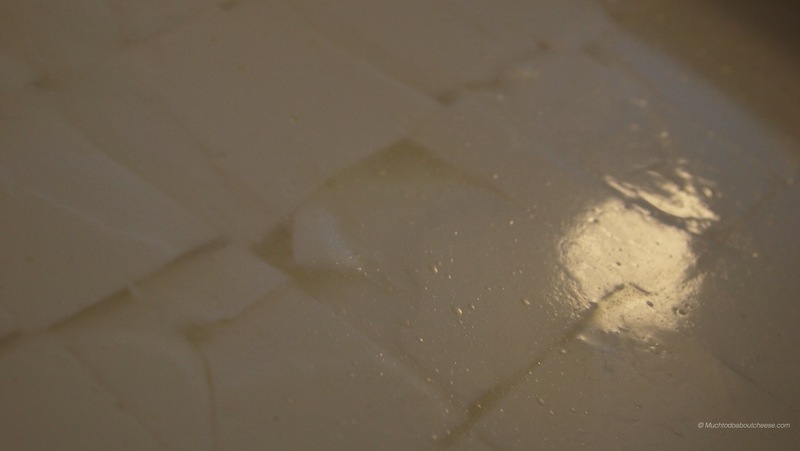 Now it was time to mill and salt the curd than place them in a mould to drain. I milled the curd and added the salt by hand. 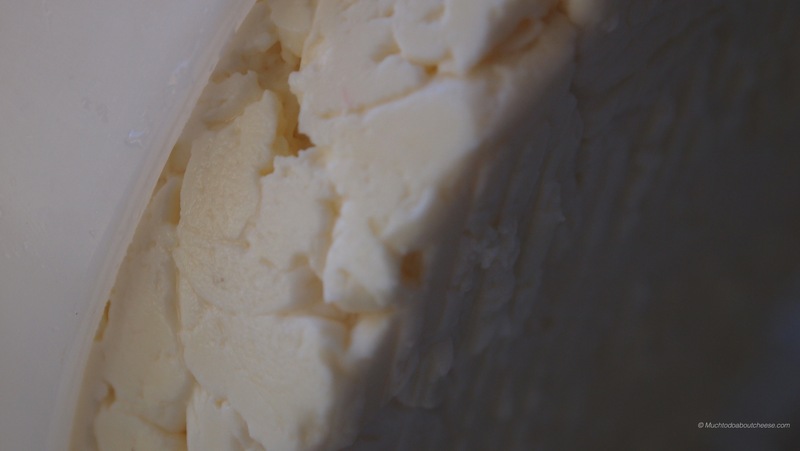 Stilton is not pressed in the traditional sense, it uses the weight of the curd to press the curd. I don’t own a proper Stilton Mould, but I do own a Camembert hoop so I pressed it into service. 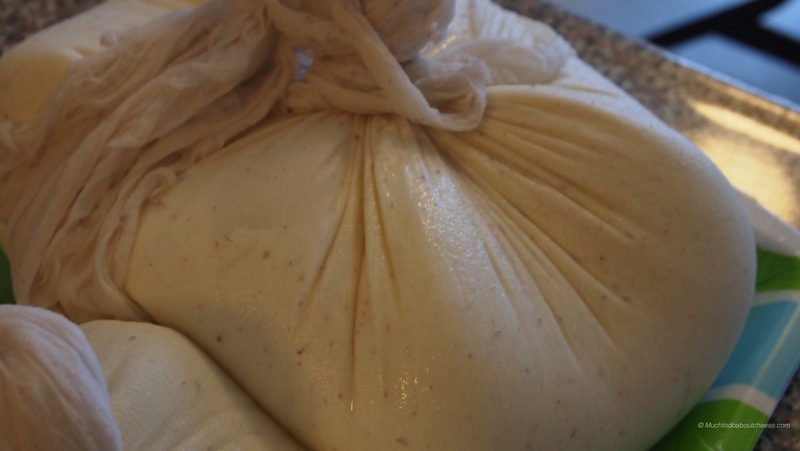 I packed the curds into the hoop. 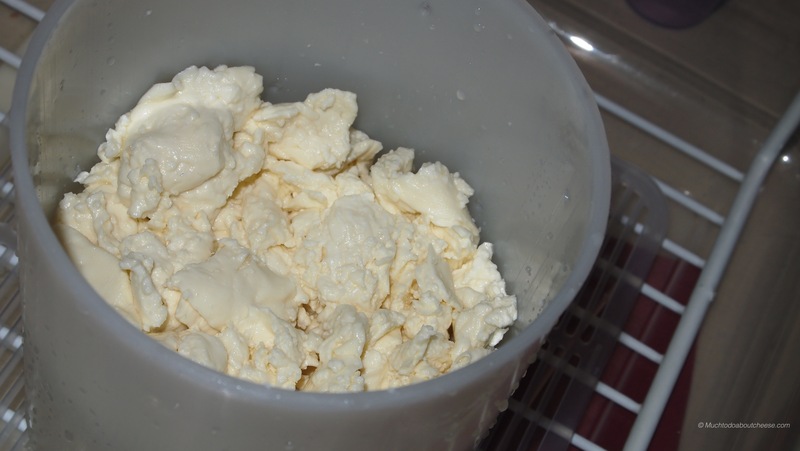 I used my hand to press the curds down a bit and left them to drain. 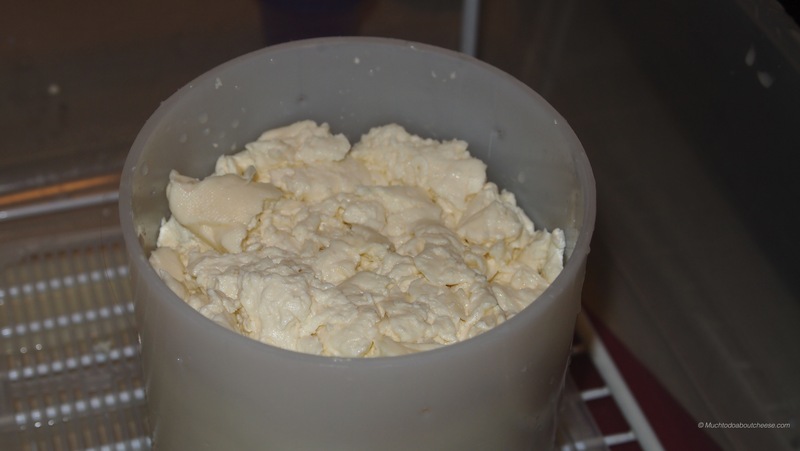 The curds were flipped after 30 minutes, then again after 4 hours, then 12 hours, which would be at 10 AM the next day. 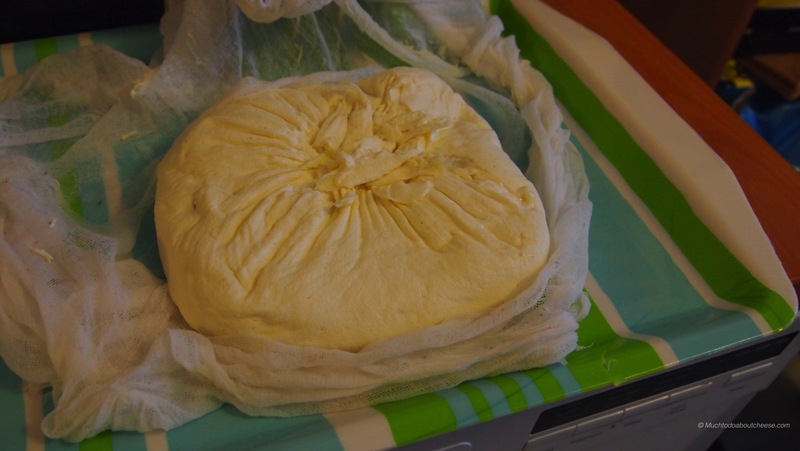 After that you flip the cheese every day for 3-5 days while keeping it at 18-20 degrees celsius (room temperature). 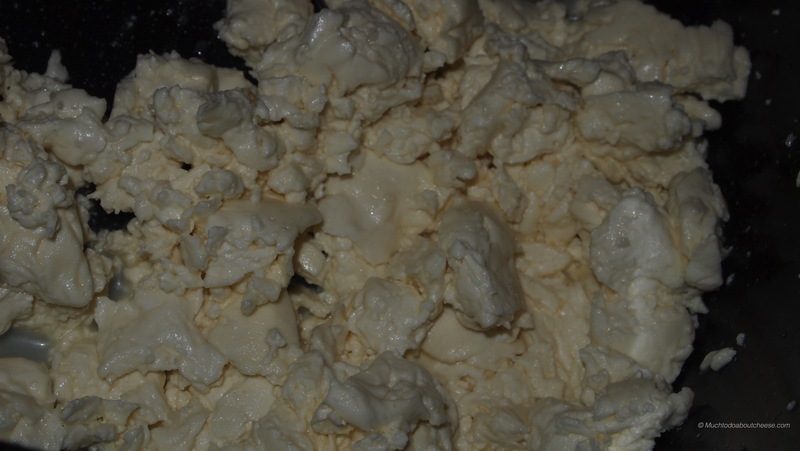 This is a picture of the cheese then next day. See how well the curd has knitted together. 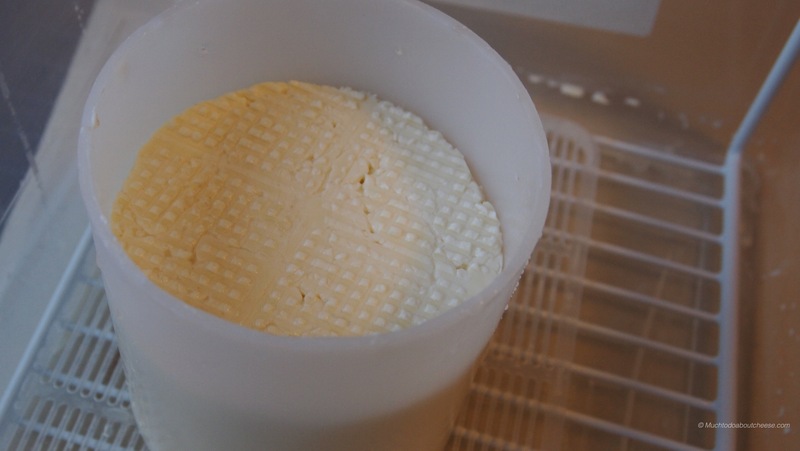 At the start of day 3, you can see how the curd has knitted together, but there are still gaps in the rind. I am happy with the way there are some gaps, I want the blue mould to take root in these nooks and crannies. Eventually I will smooth the rind in a process called “Rubbing Up”, where you use a knife to smooth the surface. I hope to shoot some video of this to share, if not I will have some pictures. As this is the last day of 2014, I wanted to take the time to thank everyone that has visited Much To Do About Cheese over the past year. I am constantly surprised at the amount of traffic that this site gets, thank you I am honoured. All the best in 2015 – Lets make it a year of Cheese! 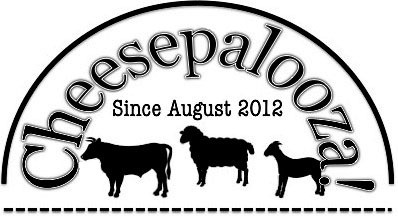 ← A Year In Cheese – The Big 3! Looking forward to seeing how this comes out. What culture did you use for this? I believe that I used MA4001 and a mild blue mold. I will double check my notes when I get home tonight.